The age of the smart home is finally and officially here. For a long time now “smart devices,” have replaced otherwise common appliances and other home and kitchen gadgets. From coffee pots that use Bluetooth, to refrigerators that know what foods you are low on, there is no denying that these products are here and they are changing the way that we live. On their own these gadgets are great but wouldn’t it be great if you could manage them all at once? It turns out that now you can. The arrival of LG CLOi is empowering home owners to connect all of their smart devices through one friendly and helpful interface that will allow you to control your home with the power of your voice. So, What is LG CLOi? 1 So, What is LG CLOi? The CLOi follows the trajectory of other similar interactive technologies like Siri or Alexa in that once you set it up in your home it will assist you by utilizing a plethora of useful and entertaining skills that you are able to activate conversationally. So yes, in that regard it is much like Alexa or even Google Assistant but do keep in mind also that this product is being manufactured by LG. In keeping with their typical areas of focus, the device is going to be particularly beneficial to the user that has already has a high tech kitchen. For example, if you have a “smart” refrigerator that analyses its own contents, you will be able to use the CLOi to help you come up with ideas as to what you should cook for dinner. Not only that, but if you have a smart oven, you can even have the CLOi preheat it for you to make meal preparation as easy as possible. In other words, for the person that already has plenty of smart appliances, the CLOi is a dveice that will quite literally help you run your house. Now that you have at least something of an idea of what the CLOi is about let’s take a look at a few of the features to see if it is right for your needs. The principle function of this device is the way in which it links your smart appliances together. As already stated, this function can play out in any number of ways depending on your lifestyle and current home appliances. Naturally, this is not a necessary function but it is definitely convenient. Think about it: this device literally lets you tell your oven what to do. You know, so to speak. 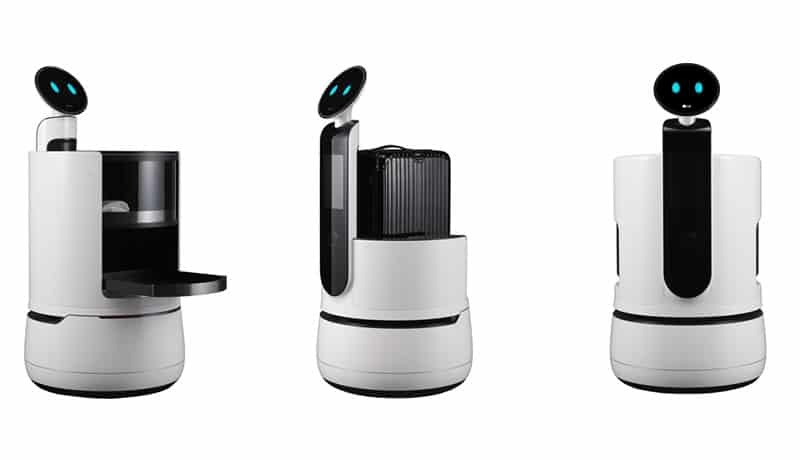 The virtual assistant present in the Hub Robot, or the CLOi isn’t going to be able to fetch the mail but it will be able to play your music, look up recipes, and even tell your children bed time stories. These features are not going to be new to owners of Echo or apple products, but they are nevertheless a welcome addition to this unit in that it helps make it even more versatile and useful. The screen is something of a nifty feature for the fact that many similar products on the market (such as most Echos, and the Google Home) don’t incorporate them. Since the device is voice operated, and therefore without a conventional menu, you don’t technically need the screen, but it certainly does make things a little bit easier. For example, if you decide to use your device to look up a recipe, the screen allows you to not only listen to the recipe being read to you, but also to follow along on the screen if that is what you want to do. Additionally, the screen also gives the device a lot of personality. By default, the screen is supposed to make the device look as though it has a face, with two big blue eyes that give it the appearance of an adorable robot. Depending on how you are using your CLOi, the screen will even change to give the “face” different features, further increasing the personality of the device. This is a product that is desinged to make things more convenient for home owners. Do you technically need it? No, this is definitely a splurge purchase, but it is a really cool splurge purchase. We already live in an age of rapid information, but being able to look up recipes or que up your favorite songs simply by issuing a quick voice command definitely takes things to another level altogether. And those are just the surplus features of the unit. Do remember that the principle function of CLOi is to sync up your smart appliances. Turning on your oven, activating your robot vacuum, or really any other smart appliance can now be done with simply your voice. There’s definitely no denying that that is a convenient and cool opportunity for the tech savvy owner. Now, these things being said, if you don’t have a lot of smart appliances, you probably are not going to get a lot out of this product. Yes, it does still allow you to do pull music or recipes from thin air, but there are also other similar products on the market that are able to accomplish that, many of them available at more affordable rates. This is definitely a purchase that is perfect for the home owner that is looking for as much control over their appliances as possible, and already has the hardware to make the most out of it. Is the LG CLOi right for you? That’s the question isn’t it. Right now this product is still very new which means that it is probably going to experience something of a learning curve. It will do some things great, and other things not so great. That’s just the reality of a product launch. In other words, it’s not so easy determining whether or not this product is for you yet. Now, that said, the promises of the LG CLOi are certainly very appealing to those that can take full advantage of them. If you already have some awesome smart appliances, the LG CLOi may very well be the perfect way for you to enjoy them like you never have before.